As I mentioned a couple months ago, it is now known that the 'Secret Belgian binding' was invented by Anne Goy in the 1980s. It is not an obscure historical binding as many people thought. 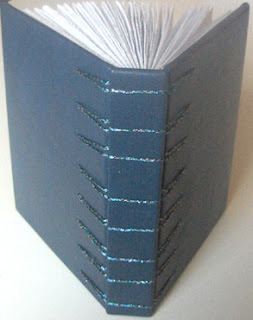 I had a little note directly from Anne after I posted here, and she says that she wants this binding to be called "Criss Cross binding" -- rather than the secret Belgian Binding. It's going to be hard to convince people to change their name for this structure, I think, but I wanted to share that information so that we can at least make an effort to call it by its proper name! So we should now perhaps say 'Anne Goy's "Criss Cross" binding'? But you're right '"Secret" Belgian Binding' has a certain enticement about it - it sounds mysterious and a little exciting. Why would folks want to give that up? "Anne Goy's Criss Cross Binding, formerly known as the Secret Belgian Binding"
The inventor should not always have the final say. I think Secret Belgian Binding is far more interesting than criss cross. Let's leave a little flavour in the matter. Like the green cupboard in the basement, always called the green cupboard, even after it was painted brown. Or the game of tag we call Primate's Tag because the Anglican Primate of Canada taught it to us and he couldn't remember it was 'properly' called couples tag.